In recent years, an expanding conglomerate of armed actors is engaged in training operations, targeted killings and manhunts, often outside conventional war zones across the Middle East and Africa. These Western state-led operations mark a shift away from ‘boots-on-the-ground’ deployments towards light-footprint military interventions, and involve a combination of drone strikes and airstrikes, special forces, private contractors and military-to-military (M2M) training. 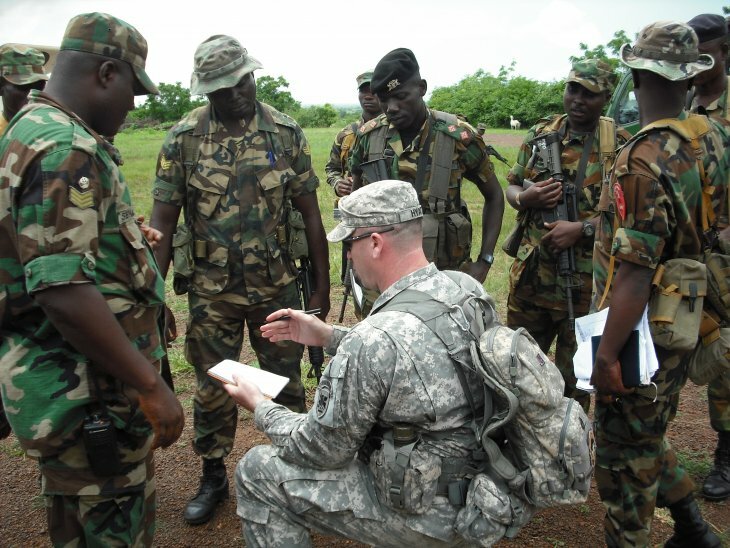 Established in 2008, the US Africa command (AFRICOM) has spearheaded this form of military engagement in Africa. AFRICOM special forces, for instance, share military bases and engage in training ‘African partners’. Although not an entirely new phenomenon, the reliance on countering security threats at a distance through military partnerships is on the rise across Africa, and cynically results in having local partners doing most of the killing and dying across shadowy, and dispersed battle zones. Largely, these military interventions remain hidden from Western publics. And if they incidentally appear on our screens, constant accusations of tampering with evidence, a lack of clarity on who is involved and why, and the repeated claim that interventions are ‘precise and clean’, blurs any political debate on civilian casualties, responsibility, and accountability. Moreover, the remote nature of this new form of warfare has allowed Western parties to physically withdraw from the battlefield. Returning An important by-product of the militarization of the region is the worsening of local security dynamics, including retaliation attacks against civilians.body bags are increasingly a thing of the past, and so too An important by-product of the militarization of the region is the worsening of local security dynamics, including retaliation attacks against civilians.is public outcry and scrutiny. Together, the remoteness and elusiveness of contemporary interventionist warfare renders it invisible to those not at the receiving end of the violence. The result being that Western intervening states no longer invest energy into publicly legitimizing their reasons for military intervention beyond the catch-all cliché of (national) security. In our article for Security Dialogue (free access), we aim to ‘make visible’ and ‘make strange’ these new forms of warfare. We present a framework to study why and importantly how Western states are engaging in remote warfare and how this has political consequences. More specifically, based on online investigation and years of field work in east Africa, we examined how AFRICOM engaged in security cooperation with regional allies in name of defeating The Lord’s Resistance Army (LRA) and arresting its commander Joseph Kony. Our main conclusion is that the deployment of 100 AFRICOM special operation forces to train roughly 3000 African Union troops to ‘hunt down Kony’ between 2011 and 2017 under operation Observant Compass never corresponded with the LRA security threat on the ground. At the time AFRICOM began its militarization campaign, the LRA was already in serious decline (an estimated 250 armed fighters). The target centered man-hunt did, however, allow AFRICOM to establish operational capabilities and ‘know how’ for a mobile military footing in a volatile and resource rich region. Under the cloak of ‘hunting down Kony’ AFRICOM has built an archipelago of pop-up military bases in Uganda, South Sudan, Democratic Republic of Congo and Central Africa Republic, serving as hubs for surveillance, airlift, intelligence and reconnaissance operations across Africa. This emphasis on assembling a flexible infrastructure of partnerships and operational capabilities shows how AFRICOM is primarily about the monitoring, and, if necessary, disrupting and containing of potential risks to US interests. An important by-product of the militarization of the region is the worsening of local security dynamics, including retaliation attacks against civilians. While African Union soldiers reportedly have looted resources and preyed on locals, military elites have secured anti-democratic regimes through forging alliances with AFRICOM. None of the actors involved in what we have named the ‘Kony military assemblage’ is held accountable for the lives lost and damage done under operation Observant Compass. Meanwhile, US military attention and resources have shifted to the Sahel and Magreb region where similar arrangements are being rolled out (particularly in Mali, Mauritania, Chad and Niger). The fluidity of these military arrangements has radically upset conventional ties between war, space and time. The major technique of remote warfare is the rejection not just of territorial conquest, but also of winning ‘hearts and minds’, along with the related responsibilities and costs of order and nation building. Instead, what is at its core is disruption, access and containment. Warfare has become liquid: temporally open-ended, as well as spatially dispersed and mobile. A slippery and mutable form of organized violence, through which people are harmed and killed, but which remains elusive and unaccounted for.